Breville, Russell Hobbs, Tefal, Kambrook and more brands with their kitchen appliances, are available products on the latest Big W Catalogue. The deals are valid on 7 - 20 February. 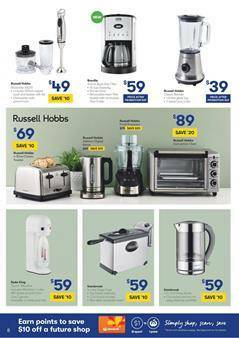 Start browsing kitchen appliances on pg 8. A new product is available in this aisle. Breville Aroma style drip filter coffee maker seems a simple product for your morning filtered coffee making. Save $10 on this device. It offers an LCD display, too. Stainless steel rims, plastic structure and stable product for years. I don't see a thing stopping me from buying one. Big W Catalogue has the best products for your breakfast. My favorite one is Russell Hobbs 4-slice classic toaster. 4 slice toasters are the best for families. You don't need to wait for your dad's round. Now, you can save $10 on that toaster. An effective, time-saving, durable product that can also be used for defrosting. It has removable crumb trays for simple cleaning. Imagine you have that coffee maker, and this toaster together. Great weekend breakfast sessions are waiting for you. Also, see all other kitchen appliances from this catalogue to save even more on your purchases for improving the quality of daily life. Your entire life to be precise. Discover home appliances in this catalogue. Big W resets the prices of smartphones, vacuum cleaners, books, snacks, toys, baby clothing, and more categories. Follow the Facebook page for the future deals from the retailer. Follow us for more posts.